These humans were at their humble beginnings young magicians who got banished from their native villages, either due to having broken the law or practice of forbidden magic, but now they are forced to live in the woods as fugitives. Ever wanted, they have to rob the travelers to survive, to this end many of them join the one outlaw band or the another, providing their skills in magic to them instead. In addition to their magic power, exiles are able to prepare potions and mixtures which can heal every type of wounds, including poison-based ones. The older ones acquire uncommon wisdom and knowledge. 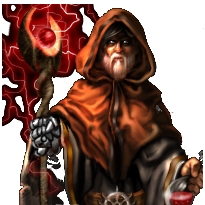 Some of them become powerful wizards able to use both elemental and arcane spells with great skill, throwing fireballs, ice blasts and lightning bolts from their staffs, which are real symbols of their power.